European Union countries are meeting in Brussels to discuss a joint strategy for negotiations with the UK over Brexit. Twenty-seven countries will be present, but the UK will not take part. Official talks between London and the EU will not begin until after the UK general election on 8 June. In a letter to leaders of the EU-27, European Council President Donald Tusk says agreement on “people, money and Ireland” must come before negotiations on the EU’s future relationship with the UK. The UK government has said it does not want to delay talks on future trade relations. The EU issued draft guidelines on Brexit on 31 March. 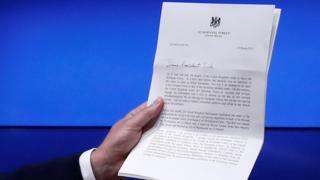 Mr Tusk’s letter – calling for a “phased” approach to Brexit – echoed German Chancellor Angela Merkel’s priorities, which she set out on Thursday. “We will not discuss our future relations with the UK until we have achieved sufficient progress on the main issues relating to the UK’s withdrawal from the EU,” he said. “There is no free lunch. Britons must know that,” he told Germany’s Funke Media Group. EU officials estimate that the UK faces a bill of €60bn (£51bn; $65bn) because of EU budget rules. UK politicians have said the government will not pay a sum of that size. The UK Brexit Secretary, David Davis, has said that in the event of such a vote, Northern Ireland could become “part of an existing EU member state”.